How does this scenario happen? You're running late and you forgot about dinner…again. Oops. Or maybe you’ve even purchased all kinds of yummy food at the grocery store. Your fridge is full and yet…here you are, veering off your plan. Either way, you're back at it: feeding your family's fast food addiction. You’re in line at McDonald's again. Now, don’t get me wrong. I love me some fast food as much as the next girl. Chick-fil-A? Sign me up! Waffle fries? Yes, please! But, fast food isn’t great for every day. Sure, the drive-thru is convenient, but there are often other fast food alternatives that are just as convenient (if not more so) AND less costly. And hey, there are plenty of other reasons to quit the fast food addiction. Like, it’s not super healthy (hello, top button on my jeans) and fast food doesn’t make you feel like you're adulting very well, either (who really wants to eat junk in their car?). There’s hope! 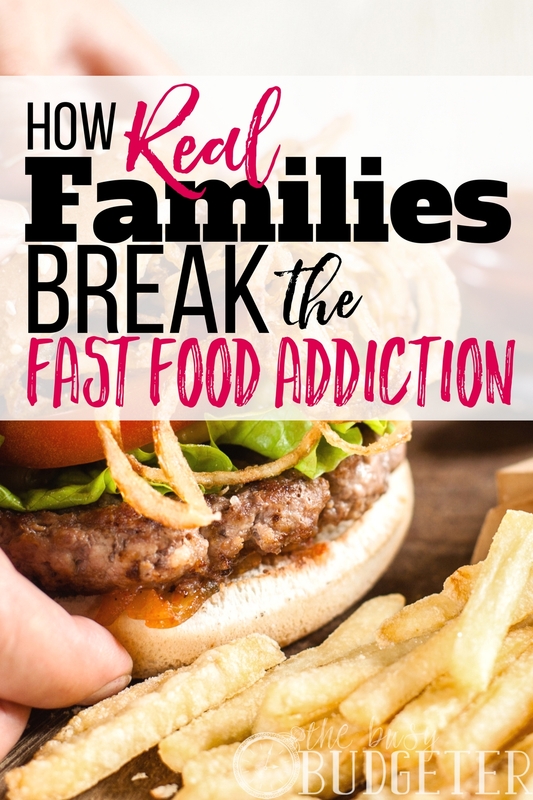 If you and your family are addicted to eating out, you can get over your fast food addiction. I’m going to help you break the cycle. So why do you do it? Why do you go to the drive-thru when you don’t feel great about going there? Why does it seem like dinner is never, ever, EVER planned ahead? OR why do you end up at Wendy’s, Burger King or Carl’s Jr., when there’s a fridge full of food at home? Why come up with elaborate meal plans and feel guilty when you don’t achieve them? Well, you could argue fast food’s delicious, and yes, it SO IS. But the taste ISN'T what keeps you coming back for more. You’re addicted to fast food because it’s convenient. Fast food is cheap. It doesn’t require you to think about what you’re eating or put effort into cooking dinner. You wind up in the fast food lane, not because you LOVE the taste of greasy junk food every day, but simply because it’s an easy habit. Drive-thrumeals become routine. Well, it’s time to break out! I want you to snap out of your fast food addiction! It’s possible to change your ways. It’s even EASY! People change their drive-thru habits all the time. Real people. Not just super healthy, whole foods Pinterest-perfect moms either. Real people like you. The trick is to aim for a dinner at home that’s fun, convenient and as easy as the drive-thru. Meals must be simple and satisfying. They must be inexpensive and not stressful on your time or your budget. Dinner should be an event you enjoy! You can break your fast food addiction! I’ll tell you how! I want you to create a list. The list is your plan of attack for dinner. This plan doesn’t need to involve crazy recipes and complicated instructions requiring hours to create. This plan doesn’t need to be extensive. All I want you to do is take out a piece of paper and jot down ten of your favorite “regular” basic meals (not including the fancy restaurant meal you ordered on vacation or complicated dishes like your mom’s lasagna with homemade sauce). This could include fast food meals or meals you cook at home. The list could include burgers and fries, chicken salad, or pasta. Whatever you and your family enjoy eating. Jot down ten ideas. Tacos, spaghetti, sloppy joes, salads you like, soups, steak, chicken might all end up on the list. Once you write down the list, write down the basic ingredients and components—pasta, taco shells, lettuce, buns and so on. Now, consider which of these meals contain corresponding ingredients? For example, tacos, spaghetti and sloppy joes all contain ground beef. Maybe your favorite salad has chicken and lettuce, and so does the spicy grilled chicken sandwich at Wendy’s on your list. Identify these key overlapping ingredients because you’ll need more of those items for your meals. Now look over the list. What do you have on hand? Do you have pasta? Tomato sauce? Soup? Is there a bag of frozen French fries in the freezer? Chips? Bread? Check off what’s in your house. The rest of the items unchecked on the list become your shopping guide. Guess what? YOU just meal planned! Awesome! And here’s the deal—you don’t need to cook every single meal on this list. You can STILL go out to eat a couple of nights, order pizza or takeout. Add the treat to your list. Plan for it. Don’t buy extra groceries for those nights. Be realistic. Not only will planning help you reduce your grocery bill because you’ll know exactly what to buy, but you won’t buy extras only for them to spoil and get thrown out. When you go to the store with a plan of attack, you’ll come home with the items you need and none of the extras. One secret to eat-at-home success is zero in on easy and convenient recipes. When you’re searching for new ideas use 15-minute meals or simple ideas you can create in less time than it takes you to get in the car, drive to a fast food joint and order. If you put pressure on yourself to cook a perfect dinner every night, you’re setting yourself up for failure (especially if you hardly ever cook right now). There are nights a microwave meal, a can of soup, frozen chicken nuggets with fries or frozen pizza are totally okay. To help you successfully break a fast food addiction, stick with recipes you enjoy eating. While recipes and dinners don’t need to be complicated (at all), dinner should include your favorite foods. If you opt for PB&J and cereal every night, you’re going to throw in the towel and treat yourself to fast food. If PB&J and cereal keep you FROM eating out occasionally, when you really don’t feel like cooking or didn’t get to the store, then go for it! But if you don’t come up with easy ideas you’re excited about you’ll get bored quickly and the siren song of McD’s will call you in. I have tons of meal plans and 15-minute meal ideas for you to check out! Personally, I don’t love spending time in the kitchen, unless it’s a special date night or fun occasion. So, I’ve searched out as many easy, fast recipe ideas as I could come up with. 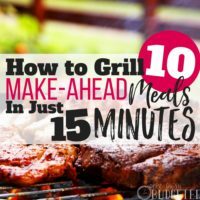 I view it like a contest or challenge: How can I get dinner on the table in less than 15 minutes? Bam! Another way to save yourself tons of time and stress in the kitchen is to use make-ahead meals and freezer batch cooking. How would you like to make 74 meals in 4 hours? Think about it—you would have a convenient meal to pop in the oven, slow cooker or heat up every night! While 74 meals might sound a little daunting, let me tell you make-ahead meals and freezer cooking work amazingly well. I’m a huge fan of freezer cooking, simply because it saves me so much time later. Yes, it means spending a few hours on a Saturday or Sunday working in the kitchen, but then that’s it. I don’t need to cook for a loooooong time. It’s awesome. Cleanup on weeknights is a breeze with freezer cooking and make-ahead meals too. If the cleanup freaks you out more than the cooking, make-ahead meals are life-changing! For many people, the thought of having a huge pile of dishes in the kitchen and having to wash pots and pans every night is too much. Dishes pile up in the sink, the house feels like a mess. Staying ahead of dishes is one of the best ways to keep the rest of your house clean. Alleviating weeknight dish pile-up will be a total game-changer for you! If you’re ready to dip your toe in the make-ahead waters, start by making a few meals ahead on a Sunday. Experiment with meals featuring overlapping ingredients: tacos, spaghetti and sloppy joes. Brown the ground beef all at once, and season the beef three ways. Cook pasta ahead and add to the spaghetti sauce. Grate cheese. Chop up lettuce for tacos and a side salad. Put the meals in your fridge and now you’ve got dinner for three nights. Turn the sloppy joe buns into garlic buns on spaghetti night, and grate cheese for your tacos. Heat the meals up and enjoy in minutes! Once you’ve tried a few make-ahead meals, take your skills to the next level by checking out a freezer plan. I promise once you give it a shot the convenience will amaze you! Fall in love with freezer meals? Sign up for MyFreezEasy. This meal planning tool’s one of the best I’ve ever found for planning freezer meals. Literally, you simply plug in preferences and all the information’s at your fingertips: grocery lists, cooking times, and a strategy to execute the plan. 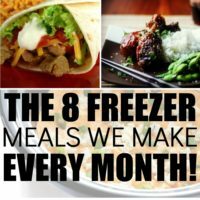 If freezer meals work for you, MyFreezEasy will up your game! Variety is the spice of life, but most of us also appreciate old favorites. When you get in “meal planning mode” you might start Pinning endless ideas and coming up with meals you don’t know how to cook. Don’t bite off more than you can chew (literally)! If your family has favorites they love (including frozen pizza and trips to McDonald's), plan it in to your repertoire. Don’t create a meal plan so complicated it doesn’t fit your families tastes—stick to your favorites. If you don’t include your favorites, you’ll still end up caving to the fast food plan and you’ll feel guilty doing it. This is how people end up throwing in the towel—because if you aim for perfection you feel like you’ve failed whenever you falter. Instead aim for progress. If you’re eating at home 5 nights a week, it’s still much better and less expensive than going out 7 nights a week! If you’re using up all your groceries and not tossing out a fridge full of food, you’ll feel more successful and find momentum to keep going. You’ll see savings and progress. 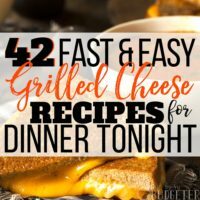 If you and your spouse love grilled cheese and canned tomato soup, enjoy it! Put the meal in your weekly rotation! If it’s working, and it keeps you on track for your goals, then there’s no harm in having similar dinners often! 5. Break the Fast Food Addiction: Enjoy Dinner Again! Make dinner special. You don’t need candlelight and a big production, but turning off television and your cell phones (or at least keeping them off the table) will give you a chance to catch up and enjoy your meals again. There are times when fast food’s a convenient solution. But there are also times we become addicted to fast food because it feels like a “treat” or as though we’re doing an activity WITH our significant other. Going through the drive-thru feels like a date (okay, a lame date, but still a date). When my husband and I were dating, we loved making meals together. Cooking was a lot of fun and a bonding experience. We’d put on music and chat and laugh. Now, there isn’t time for “date night cooking” every night, but occasionally cooking together is romantic and a blast! There are services like Blue Apron and Hello Fresh which send all the ingredients to your door to cook a meal. We tried Blue Apron and found for us, it wasn’t very practical and cooking was too time consuming. However, if you are looking for a date night option, these types of meal delivery services still cost less than restaurant meals and are a fun option. Experiment with other fun dinner activities to break up the routine of dining at home. Eat outside. Enjoy a picnic in the living room or celebrate a special occasion with a meal (like Chinese New Year with homemade Chinese food). Don’t make dinner complicated or overwhelming, but fun so you’ll feel motivated and excited to cook at home. If you’re addicted to eating out and find yourself in the drive-thru every night, you’re spending a fortune. You’re wasting money that should go toward paying off your debt, starting your emergency fund, or well…just doing activities MORE fun than going to McDonald's. Do you want a boat? Do you want a vacation? Do you wish you had money for cute new clothes? Eating fast food’s sabotaging your budget goals, because fast food costs extra money. Not only does the drive-thru cost more for your meals but often you’re paying twice—once for the bag of food you’re getting and once for the spoiling ingredients in your fridge you’re not eating. I want you to remember your dreams before you go through the drive-thru. Put a sticky note on the dashboard of your car saying “Disneyland” or “kayaks,” or even “no more debt.” Every time you consider opting for fast food, remind yourself of your goals. Don’t beat yourself up if you go through the drive-thru occasionally. Keep your eyes on the bigger picture and thinking of long-term strategies to get what you want. If you’re going to go through the drive-thru, plan the trip out. Put fast food on your weekly meal plan. Look forward to the treat and make the most of it. The rest of the time, use these ideas to make eating at home fun again. Break your fast food addiction and enjoy a home-cooked meal! Are you addicted to fast food and it’s sabotaging your plans? What cheap and easy ways have you found to answer the call of dinner? Love the comment about making dinner special. Before, during and even now post kids in retirement my wife has had a firm inviolate law, no TV on in the house during meals! We ate, and still do, together at the table and we talk. We used to have a game where the first person to get up from the meal lost. I know it was quality time with our kids and still is for us as a couple. Yes – break the fast food habit! Great ideas, Rosemarie! I think the first tip, about having a plan of attack, is the most important tip because a little planning ahead is the key to not getting to dinner time and saying “oh no, what are we going to do? McDonald’s it is!”. Along the lines of keeping the favorites and adding new…I totally do that, and one way I do it is to vary the favorites up. For example, if you love quesadillas but get sick of plan ol’ cheese quesadillas, come up with new combos for your quesadillas – pepperoni pizza quesadillas, cheese and chicken quesadillas, 3 bean and cheese quesadillas, etc. 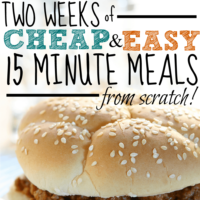 Eating at home can be cheap, quick, and delicious!! Heather | Made In A Pinch recently posted…Easiest and Fastest Way to Make Corn on the Cob! I love these tips. Planning is key, and so is pre-prep! I used to avoid pre-prepped produced at the grocery store because it costs more. Then I realized the big-picture benefits offset that extra cost. It was a real gamechanger to start thinking like that. Yes! Such a practical post!! Meal planning is a life saver when we are trying to cut back on eating out! Great tips! Fast food is so so easy! Here’s another tip: Move to the country/middle of nowhere, like we did, where there are literally zero fast food restaurants for 30 minutes! You can’t go if there aren’t any!! hah! I needed this post! I have been in a fast food funk and need to get out of it! Thank you for writing this post! Breaking the fast food addiction requires serious mental power. I know 1st hand because I love the Hibachi buffet restaurants. And I also love yo quiero Taco Bell w/ extra sour cream in my burritos. But however, I feel and know the addiction can be broken. What do you think of this sample morning nutrition and exercise – cardio routine for Monday mornings? Studies of food addiction have focused on highly palatable foods. Your right drive-thru is convenient, but there are often other fast food alternatives that are just as convenient (if not more so) AND less costly. Thank you for sharing this!